Agilent Technologies have released a display tester designed for easy, customisable setup for visual testing of up to five major display formats. It is suitable for testing FPD and CRT displays as well as LCD panels in PC and TV manufacturing. The Agilent U8101A supports all major analogue (S-Video, YPbPr, CVBS, VGA) and digital (HDMI and DVI) interfaces, and allows for future upgrades to new interfaces. The flexibility of multiple plug-in card slots enables test technicians and engineers to customise instrument configuration according to their needs. 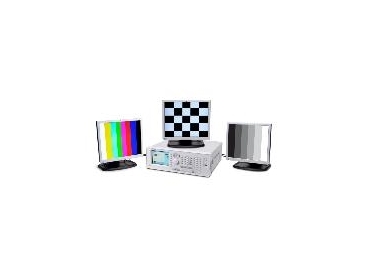 Agilent Technologies display tester uses a 5.7-inch colour LCD display and Windows(tm)-based graphical user interface (GUI) to simplify test pattern selections. From the front panel, operators can easily select different display formats, test configurations and other frequently used functions. Coupled with the capability to recall up to 16 test sequences and patterns, these features help to minimise manual input errors and reduce test setup time. In addition, the U8101A comes with USB capability for convenient high-definition patterns and image transfer to tester and hassle-free firmware upgrades. The display tester also sets the benchmark for scalable, cost-effective test solutions as users only need to purchase test cards according to their test requirements.